Disclaimer: This isn't the actual status hearing transcripts. Publication of official transcripts is against the law. The following is MY OWN NOTES, referencing the official transcripts which were obtained lawfully. These aren't all the status hearings but what's availbale to me as of now. Attorney General filed a motion at the time of the arraignment on February 8 and refilled on Feb 9 and March 19. The judge asked Ms Saunders of her opinion of this ruling. She is “in complete agreement” with the “expressly” part. But she believes that “in the disjunctive”, it gives the Board and the AT Office opportunity to make recommendations that are in public interest. Ms. Saunders also point out that in Gray vs. Superior Court, the defendant wasn’t given enough notice. The lack of notice was unreasonable, NOT what was asked. AG Office isn’t seeking to suspend Murray’s license which would be done by the Medical Boards. The AG Office is asking that Murray is ordered not to practice medicine, pending thee outcome of this Trial. The judge raises the issue that this request comes from the Medical Board and the AG office, NOT from the prosecution in this Trial. He asked that if the court was to grant a hearing to discuss this matter, who would preside it? Ms. Saunders states that she doesn’t agree. She stated that the circumstances have changed. She argues that during Alberto case, the Gray case wasn’t even ruled yet. Gray case prevented the Medical Board to make recommendation before giving notice. Mr. Low doesn’t believe that they should be punished for doing the right thing but he doesn’t believe that is the case here. He contends that arguing over this matter makes as much sense as arguing in this court to suspend Murray’s driver license. Low diminishes the purpose of the notice “what is it that they are giving notice to? They are giving notice of the fact that they want to stop this man from helping people” Low wonders if they could have given the defense notice prior to the arraignment court. He states that the Board should have given them notice before coming to the court. Low feels not hearing their recommendations today wouldn’t be punishing them and that they should obey the rules like everyone else. Low suggests that if Medical Board and the AG Office would like to be heard, they should set up a board hearing conducted with constructional 14 amendment due process rights and privileges so everyone can be properly heard. Judge asked why can’t that hearing be in this court. Low affirms that if the judge decides to have the hearing in his courtroom, he can. But the Medical Board and AG Office needs to present evidence. “An accusation is not going to get it done” Low stated that the motion in judge’s hand is accusation only. Low gave an example from the motion. “Defendant Murray administered a lethal dose of Propofol as well as other drugs to patient Michael Jackson” Low asked the judge if at this point, if there is any evidence that supports this accusation. Low points that the recommendations are for bail condition. He states that Judge Schwartz already ruled on that. Low addresses Ms Saunders remarks that circumstances have changed. Low asked the judge “what has changed? The exact declaration they gave to Judge Schwartz is the same declaration you have in your hand.” He states that if the defendant violated bail conditions, then a judge may revisit the issue. “None of that happened here, none” Low said that Murray helped a gentleman in distress on a plane and Murray helped him. He claims if anything changed, it changed for the positive. Low doesn’t believe this court has the authority to do so. He states that he know that judges doesn’t like it when they are told that they don’t have the authority to do something but he was being impartial and fair. He believes, Alberto case ruled that having a judge change bail conditions is “forum shopping” He states that if they want the Judge Schwartz to revisit his ruling, they should go back to Judge Schwartz and not put Judge Michael Pastor on the spot. Mr. Low has attended to cases where after the preliminary hearing, the Medical Board will ask the judge to suspend a medical license, pending the outcome of the Trial. He suggests a similar hearing and NOT a hearing as part of the bail conditions. Chernoff said because Judge Schwartz had read the motion by AG Office and he considered all the evidence before making his ruling. Ed Chernoff points out that the Medical Board could have revoked Murray’s license “four months ago, six months ago, a year ago. They can do it tomorrow” They can do it through preliminary injunction or a full-blown hearing. So the protection that AG Office is seeking could be done without the AG Office, by the Medical Board. The judge said “there is often times in the real world a belief that the judges can make up the rules as they go through the case and that if they don’t like the rules, they can change them. The Los Angeles Superior Court is mandated to follow the law. I am a member of a tribunal of the LA Superior Court. The question presented to me is whether this court has legal authority to address the motion presented by the AG Office on behalf of the Medical Board. My personal opinions are of no concern. The issue was first raised on February 8 in the context of bail conditions. Ms. Saunders is correct. The AG Office appeared for the purpose of giving notice. Judge Swartz accepted the representation of the Attorney General. Judge Swartz addressed the issues raised by the prosecution, namely the amount of the bail and the issue of restricting Dr. Murray’s travel. Judge Swartz specifically said ‘I have already read the Attorney General’s motion in its entirety” And then Judge Swartz went on to articulate the very specific restrictions on Dr. Murray’s ability to practice medicine. Whether there is jurisdiction for such an order or not is beyond my authority because I simply don’t have the ability to revisit the actions of one of my colleagues. I will read you the law I must follow. “For one superior court judge, no matter how well-intentioned, even if correct as a matter of law, to nullify a duly made erroneous ruling on another superior court judge, places the second judge in the role of an appellate court judge. The Superior Court of LA County is a single court and one member of that court can not sit in review on the actions of another member of that same court.” It doesn’t matter if I agree wholeheartedly or disagree in whole or in part. It doesn’t matter at all. It has to do with the law and this court’s obligation to follow the law. So I am not going to decide this case on its merits or the motion filed by the Medical Board. The Medical Board is aware that there are other procedures available to them. I have nothing to do with those procedures. So if the Medical Board wishes to pursue those avenues, they are entitled to do so." Flanagan stated that after Michael’s death, a syringe on the floor and another syringe in the IV port were found at the scene. Coroner’s office did a qualitative test to determine what was in these items. The fluids from Michael’s body was subjected to quantitative analysis base don which they determine the cause of death. Flanagan asked the coroner in April about why they didn’t do a quantitative analysis on the syringes. Coroner said to Flanagan that they only do quantification analysis to determine the cause of death. The defense wants the fluids from the syringes and IV quantified. The “broken” syringe contents have deteriorated to salt. The IV and the other syringe (stuck in IV port) still have liquid in them. Flanagan prepared an order that authorizes the LA County Coroner to do a quantitative analysis on these items. Flanagan talked to LA Coroner Toxicologist Jamie Lintemoot last night and she told him that would try to quantify the fluids but she can’t be certain. Lintemoot stated that she would need fluid samples from Michael’s body as a reference. Since there are only enough fluids to test one time, Flanagan proposes that DA office chose a lab that they think is independent to do this analysis which would take 1 months to 1 ½ month. David Walgreen feels that the order is premature. Last week, Ed Chernoff asked him, if the prosecution would be okay if the coroner’s office did the analysis. This was the first time that the defense brought up the issue. And in this court, moments ago, Walgreen was handed the order by Flanagan. Deputy DA Walgreen would like to speak to analyst before the order is considered. The judge decided that he won’t sign the order now. He will allow the counsels discuss the issue and come up with a resolution. If that doesn’t happen, the issue will be brought back to court. David Walgreen said that Deborah Brazil and he met with the Toxicologist from the coroner’s office. Coroner’s office expressed some concerns regarding the testing. David Walgreen advised the coroner’s office to prepare an official document, expressing their concerns. Coroner toxicologist Jamie Lintemoot and her supervisor Dan Anderson are working on the report and they didn’t have the final draft for today. Walgreen predicts that he should have the document by Monday. Once he receives the document, Walgreen will submit copies to court and the defense. He proposes that they will go from there. David Walgreen sent a letter, along with the documentation. Walgreen had 2 proposals: One: The defense and the prosecution split the residue and have them independently tested. Flanagan states that his understanding from the coroner’s report is that coroner’s office isn’t certain that there is enough residue even for the testing. So Flanagan doesn’t think splitting the residue is a good idea. Second proposal David Walgreen have is that both sides agree to let the Coroner’s office do the best job they can. So the defense opts for option number 2 to have coroner’s office do the testing. David Walgreen suggests that Flanagan writes up the draft for testing order. Prosecution may amend it. The order will include the wording that both sides recognize that the coroner’s office have never have to do testing for crystallized Propofol and Lidocaine residue and the results are experimental. And that both sides recognize that the testing may result in the destruction of whatever residue is left in the syringe. Flanagan will prepare the draft of testing order, run it by the prosecution and have it personally deliver to the judge tomorrow. The judge then will decide if he would sign it in its current wording. “Dr. Murray, you are charged in count 1 of this felony information with a violation of penal code section 192(B), which alleges that on or about June 25, 2009, in the county of Los Angeles, you did unlawfully and without malice kill Michael Joseph Jackson, a human being, in the commission of an unlawful act, not amounting to a felony; and in the commission of a lawful act which might have produced death in an unlawful manner, and without due caution and circumspection, this offense is called involuntary manslaughter, a felony. Do you understand the charge? The judge stated that the maximum penalty for this charge in 4 years in State prison. Murray is entitled to a speedy trial, within 60 days of today. Murray has a right to remain silent and not incriminate himself. Murray has a right to confront any witness against him. Murray has a right to testify and have witnesses testify using the subpoena process. The prosecution expresses one of their “paramount concerns”. They have not received any discovery from the defense team. The judge reminds that parties that they have statutory responsibility towards each other to provide full discovery. Yesterday afternoon, court was presented a form, indicating that Narej Gourjian would join to Michael Flanagan and Ed Chernoff. Mr. Gourjian states that his involvement with Michael’s case was minimal. Ed Chernoff stated that the Michael Jackson case in 2005 and Conrad Murray case in 2009 aren’t related. Michael isn’t a party in Murray Trial. He is just the “alleged victim”. Ed Chernoff believes that there would be no conflict of interest in Mr. Gourjian joining. David Walgreen expressed concern that they were supposed to receive the discovery from the defense but they haven’t received it yet. They only received a witness list but not any sort of discovery. Murray defense listed 91 people. Prosecution provided the defense team with witness list and discovery. “We are insisting on our discovery”. Ed Chernoff said that they won’t take written statements from the witnesses unless judge orders them to do so. Ed Chernoff stated that they do not have the requested information on hand. They have meetings set up in the next 2 days with their witnesses. They will turn over to the prosecution any relevant information they obtained. David Walgreen isn’t happy. He understands if the witnesses haven’t been interviewed yet, He wants to know if the defense already talked to any of the 91 witnesses. If they have, the prosecution wants written statements from these witnesses. “This is gamesmanship” Mr. Walgreen said. Today they provided the defense with 7400 page written discovery. The defense has been submitting their discovery as soon as they get them. To date, the defense hasn’t submitted any discovery. “The defense counsel is coming to court saying they are ready for trial and want it to start on March 24. This is putting the people at a disadvantage. This is unfair to the people. This denies the people a right to a fair discovery. It is a two-way street. We want our discovery. We want a fair process” Mr. Walgreen said. Ed Chernoff stated they should be able to submit their discovery by the end of this week or early next week. They are not hiding any notes. Ed Chernoff said that when he sent requests to David Walgreen about the discovery, Mr. Walgreen sent what he had at the time and provided the rest as he obtained them. Chernoff wants Walgreen to trust that he will do the same. By Friday, they should receive all information. But if they don’t, they will turn over what they have. The defense team turned over some discovery to the DA’s office but sent to David Walgreen who stated in last court proceedings that he wouldn’t be available this week. Deborah Brazil didn’t receive any discovery. Judge thinks it may be in Walgreen’s office. Mr. Flanagan personally delivered to the 17th floor receptionist. He said for her to give them to David Walgreen, he didn’t mention Deborah Brazil. Judge asked Deborah Brazil if she would like to leave to check on the file while he addresses other issues. She would like to be present in the court. Mr. Geragos and Howard Weitzman don’t want to talk in open court. They want to talk to the judge in camera ex parte. Geragos stated that he likes Mr. Gourjian like his son. 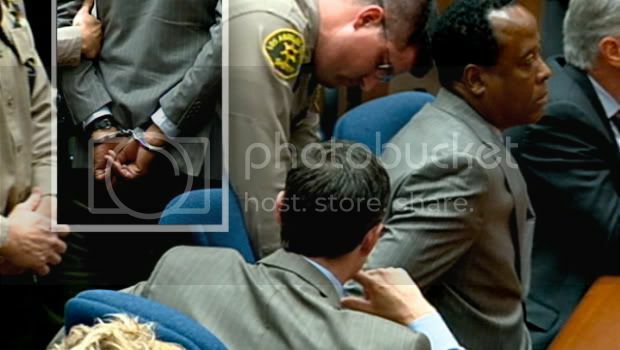 Judge wants a declaration from Conrad Murray. Ed Chernoff said that the defense already submitted a declaration by Murray, stating that he wants Narej Gourjian to be part of his counsel. The judge points out that there are approximately 51,000 licensed attorneys practicing in LA and they found themselves in a possible of conflict of interest issue. Deborah Brazil has some discovery from the defense. She didn’t have the time to review them thoroughly but took a cursory glance. Defense listed 91 witnesses but didn’t provide any notes or written witness statements. She stated that unless the defense counsel complies with the discovery rules, the prosecution can’t declare themselves ready for the Trial. She has additional discovery on a CD from the latent print investigation lab. She will turn it over to the defense. There will be additional discovery of print comparison but it won’t be ready for a week. Prosecution received 12 brief statements from defense witnesses. Flanagan stated that they submitted 3 CVs belonging to 3 expert witnesses, Dr. Paul White, Dr. Richard Haraszti and Dr. Jones. The defense doesn’t intend to obtain witness statements from these witnesses. Many of the witnesses they listen are prosecution witnesses whom they haven’t even talked to. The 12 witness statements came from patients of Murray that may be potential character witnesses. The judge stated that the defense talked to witnesses and they can’t just choose to say that they have nothing further. Judge stated that saying “we are not going to provide any written or recorded statements” is “playing fast and loose with the code”. Mr. Flanagan said “There are not witness statements for a lot of the names that are in the witness list because we are relying upon police report statements”. Flanagan says they don’t plan on taking witness statements from character witnesses. The judge asked if Flanagan plans on putting witnesses on stand without knowing what they are going to say. Flanagan responds that he intend to talk to them maybe a week or so prior. He will remember what the witness will tell him, he doesn’t need to write it down. The judge doesn’t want a witness to take a stand and what they say is a surprise for the prosecution. Deborah Brazil retorts “Your honor, this is a clear attempt to thwart the obligations of the defense pursuant to discovery.” She stated that the defense opting to talk to their witnesses prior to their testimony and not share the information with the prosecution inhibits reciprocal discovery. She pointed out what Flanagan said that Dr. White will testify. She said that there is no evidence that Michael’s death is connected to Demerol. No Demerol was found in his body. She wants the court to intervene and order the defense to provide statements from the witnesses. Flanagan interrupts her, she retorts “I am not finished”. She continues to address that for their character and expert witnesses, they don’t just ask LAPD to take statements. She also argues the notion that half of defense witnesses are on prosecution witness list. The prosecution has complied with the penal code and submitt4d to the defense over 7000 pages of discovery. Defense team hasn’t complied. The judge told Flanagan that he commends him for his good memory but that is not how things work in courts. The prosecution is entitled to full discovery reports by the defense. The judge stated that while Murray is entitled a speedy Trial, the prosecution is entitled to a fair discovery. Flanagan addresses that on Jan 27, they submitted an informal request for discovery to the prosecution. Upon no respond by the prosecution, defense filed a formal motion for discovery. The defense wants all the pictures that the prosecution has. They want the pictures to be high quality. He complains that the pictures they received are watermarked, thus, unrecognizable. Deborah Brazil asked for permission to respond to Flanagan on issues he had. Issue on defense motion: The prosecution witness list. It contains 106 witnesses. The discovery prosecution gave to defense includes names and witness statements. Flanagan asked if the prosecution will agree that if the witness addresses aren’t provided, the prosecution won’t call that particular witness. Deborah Brazil stated that this was a very sensitive case and the addresses were redacted for privacy. She proposes an on-camera hearing for the release of the address or if the defense can tell the prosecution what witness they would like to talk to, prosecution will contact that witness and have her/him available for the defense. In the motion for discovery, defense itemized the witnesses for which they have no clue of who they are, where they live, what they will testify to and if the prosecution plan on putting them on stand. Court orders that if there is something particularly sensitive to witness addresses, then the prosecution should arrange for the defense to be able to contact them. Issue on defense motion: Rebuttal Witness list. Deborah Brazil said they can’t give that until they receive witness statements from the defense. Chernoff stated that during preliminary hearing David Walgreen claimed that Murray was “incompetent, reckless, impatient and unknowing with regard to the use of Propofol”. These are the character issues defense will to rebut by Murray patients taking the stand as character witnesses. The discovery that the prosecution received includes names and addresses of these patients, how they know Murray and what they will testify. The defense wants to know if the prosecution will have any rebuttal for these character witnesses. Deborah Brazil argues that she received only the names of witnesses. She doesn’t know which ones are character witnesses. Court ruled that until defense provides the prosecution with witness staetement that includes what each witness will testify, he will not impose the prosecution to provide rebut witness list. Issue on defense motion: Defense wants Murray statement. Deborah Brazil states that the prosecution already submitted both the written summary and recorded interview to the defense. Issue on defense motion: Reel evidence (surveillance from Michael’s home). Deborah Brazil states that it was already submitted to the defense on a disk. Issue on defense motion: Size and quality of pictures. Deborah Brazil states that there is a significant public interest in this case. The evidence pictures haven’t been leaked and she attributes it to the watermarking. She said that if the judge orders that the defense receive non-watermarked pictures, the prosecution will provide them in about a week. Chernoff contends that the police downloaded the entire security surveillance on June 25, 2009 but the defense received a snippet of surveillance from 12;30-12;45. The defense wants the surveillance from the time Michael arrived home from Staples until he was transported to UCLA. Deborah Brazil would like to check if the defense was given the full surveillance. If the defense weren’t provided the full security tapes and if LAPD has them, she will make them available to the defense. Issue on defense motion: Autopsy pictures. Deborah Brazil want this issue discussed in next week’s court. Issue on defense motion: The defense wants un-redacted copy of the contract (editor’s note: It isn’t specified what contract but from the context, I surmise it is AEG Michael Jackson contract). Deborah Brazil states that the contract is Estate’s property. The copy that prosecution has also is redacted. Issue on defense motion: The defense wants felony convictions and misdemeanor acts involving moral turpitude. Deborah Brazil hasn’t finished compiling them yet. She will turn it over to defense, when she completes it. Issue on defense motion: Brady obligation, exculpatory. The judge asked ‘acknowledged?” Prosecution affirms. Issue on defense motion: The defense wants any notes prosecution may have taken during Dr. Calmes interview. Deborah Brazil indicates that Dr. Calmes was David Walgreen’s witness. So the court puts this issue on hold until next week to be asked to David Walgreen. The defense wants access to physically examine evidences. The defense submitted an order that allows the defense to be able to examine evidence. The judge asked Ms. Brazil to check the order for wording, she did and she finds it acceptable. She reminds the defense that detectives (at LAPD) and a coroner representative (at Coroner’s office) will have to be present, if and when the defense examines the evidence. The judge won’t sign the order today because there are some issues with the photographs to be discussed with David Walgreen next week. Ed Chernoff informs the judge that the defense needs the judge to order another state to authorize a subpoena for an out-of-state witness who is on the defense witness list. The court decided to do this ex parte on camera. This next court is scheduled to February 28, 2011 in which time both the defense and the prosecution have to meet their discovery obligations. Judge points out the Jurors are coming back on May 4. The Trial started with the jury selection. So the judge question the feasibility of the defense proposal that opening statements are made on May 23. Ed Chernoff stated that they need a pharmacokinetics expert to address the liver issues. They also need time to meet their discovery obligations to the prosecution. The defense would appreciate it if the judge granted the “2 week unimpeded” continuance. Chernoff stated that if the Trial starts on May 9, they won’t have adequate time to arrange for experts. They will be ineffective. But if the judge grants the 2 week continuance, they can prepare and start the trial ready. Chernoff said that it was a work in progress. As soon as they finish, they will turn them over to prosecution. Chernoff emphasizes that they are getting new experts. David Walgreen stated that they feel they will be in the same position in 2 weeks from now. If the defense gets new experts, the prosecution will need documents for the new experts and they will need time to evaluate the representations in those documents. Prosecution feels there are too many unknowns. They propose everyone to be ready then set a date for the trial. Ed Chernoff waves their request for a speedy trial. The judge rules that the court will vacate the upcoming juror selection on May 4. The court will write letters to all prospective jurors and thank them for their willingness to serve. The court will inform prospective jurors that they services are no longer required.